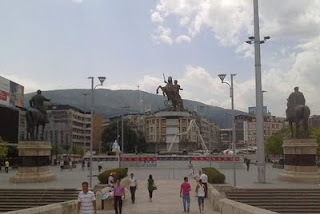 Covering an area of 140m2 and centrally located in the main square of the city, 1000 Alexandras is a multimedia monument to all Alexandras currently living in Skopje , made up of randomly chosen names found on social media sites. Originally conceived as a projection/intervention onto the recently erected monument of Alexander the Great (Warrior on a Horse), the project is realized in its present form due to fact that it was not granted a permit from the municipal authorities. Zoran Poposki's projects in public space rely on Situationist tactics to explore possibilities for collective intervention into the urban geography. Questioning cultural and material values, conventions and authorities, Poposki's projects celebrate the importance of the ordinary and the overlooked in his tactical use of instruments of historic memory creation/glorification. Continually calling for a celebration of the present, of the creative power of the everyday and the multitude, their aim is to create a new urban alphabet of the topographic, political and affective idiosyncrasies of public spaces in Skopje. As a space shared by all citizens, public space is a major source of local identity. Moreover, public space is the place where people communicate and interact with each other and engage in discourse on issues of public concern and is therefore a prerequisite for public freedom. Thus the right and the necessity for citizens to use public space as something that belongs to them and as a place for public debate and engagement in public discourse. 1000 Alexandras is part of the exhibition Skopje: between science and fiction, curated by Jovanka Popova, as part of the festival Skopje Summer 2011.